The Petronas Twin Towers in Kuala Lumpur (KL) in Malaysia became the world’s tallest buildings in 1998 to 2004 and were surpassed by Taipei 101. They constructed these buildings in a period of six years with height of 452 m (1486ft). It has a total of 88 floors with service main lifts which are double-decker, the lower deck takes passenger to odd numbered floors while upper deck to even numbered floors. Floors 39 and 40 are not accessible as office space. The skybridge connecting these two towers is located in the 41st floor where you can get a good view of KL. A shopping complex called the Suria KLCC is located in the ground floor. I visited the building on May 05, 2007 where we queued very early in the morning to avail free entrance. Did you know that this site was used in making the film Entrapment by Sean Connery and Catherine Zeta Jones? It was also a setting for some Bollywood films. 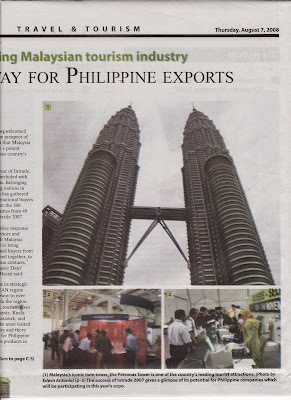 Last August 7, 2008, my photo shot of this twin towers was published in the Manila Bulletin for the second time. 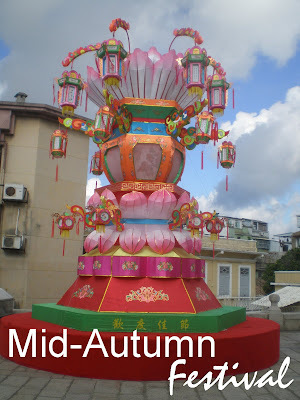 In this year’s Chinese calendar September 14 falls as the date of celebrating the mid-autumn festival or better known as Chinese Moon Festival. This is the second most important festival for the Chinese people since they believe that moon is a symbol of peace and prosperity of the whole family. This is the reason for the coming home of every Chinese people to meet their family and share dinner with them. To celebrate the festivities, there are moon cakes and pomelos to eat and enjoy. The moon cake symbolizes family unity and closeness while pomelo would mean protection since Chinese word for it is vu. Strangely, this is referred to as the day following Chinese Mid-Autumn Festival. On the evening of the actual festival children head to open spaces carrying lanterns to see the full moon. For this reason, the following day is a public holiday. Illuminated lanterns make for a pretty sight during the festivities. 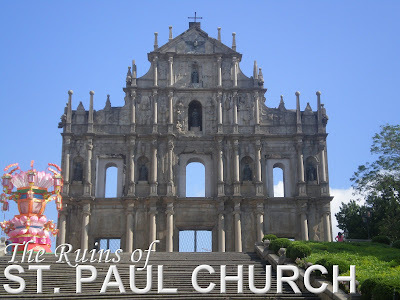 I have witnessed the lanterns early prepared and decorated in Senado Square and at the St. Paul Ruins in Macau during the last week of August. 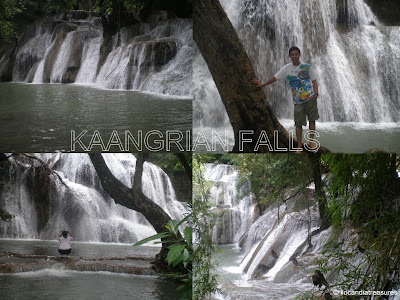 Just today, I joined the group of Green Ilocos Norte and Network Advocacy (GINNA) trek the Kaangriaan Falls located in Baranggay Paayas in the town of Burgos, Ilocos Norte. The trail that you would pass by is covered by Barangay Agaga. 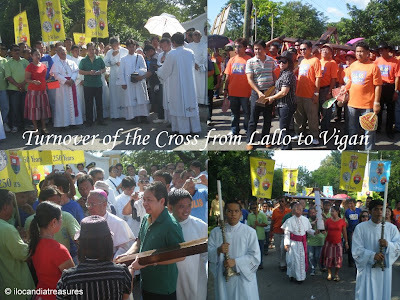 The distance runs around 10km from the municipal hall to the site. Half of the road may be accessible by car and the rest would be trekking. 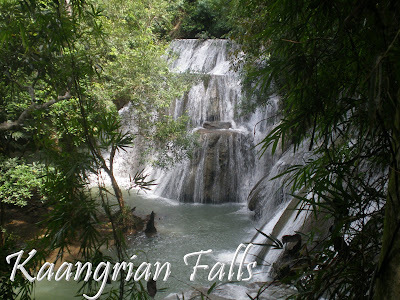 This water falls was discovered in the year 1998 when the local government was looking for a good water source and took a photo of this natural wonder. Many people including members of US Peace Corps Volunteers were impressed with it and they began to explore this place. By word of mouth, it slowly became popular tourist attraction and was featured in some travel shows. The name Kaangriaan was derived from the Ilocano word “naangri” which means stinky. The reason for arriving at this term is that there were some bat caves and the bat droppings made it stinky in the area. However, I have not smelled any odor. It was so breathtaking and amazing. Rejuvinating is the effect of the sound of falling water. One can take a dip and experience the massaging effect of the water and be refreshed. It’s the best time to visit the place during rainy season to December. The water starts to become thinner in the months of January to summer time. The water runs all the way down to Dirique in Pasuquin out to the sea. SSEAYP stands for Ship for Southeast Asian Youth Program. This is an annual cultural exchange program sponsored by the Cabinet Office of Japan. 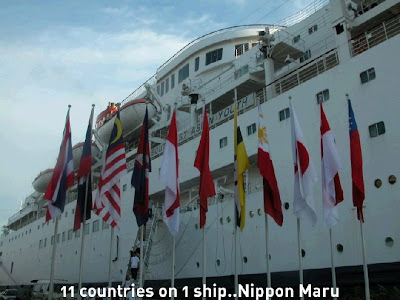 Around 300 plus delegates from ASEAN 10 countries and Japan are invited to cruise around Southeast Asian countries and Japan on board the luxury cruise ship MS Nippon Maru for a period of two months. Its exactly 6 years ago when our group from the Philippines Tambayayong 2002 consisting of 29 people flew to Japan to participate in the said program. We were billeted at Keio Plaza Hotel in Tokyo where we met the rest of the delegates. It was a life changing experience since we traveled the world meeting new friends and new families from these countries. Its truly a voyage of a lifetime since we were accommodated in a luxury cruise ship together with huge group of friends learning each other’s culture. We call Nippon Maru our second home. We shared so many memorable experiences. I remember that Prime Minister Fukuda was the one who welcomed us delegates in 2002 during the opening ceremonies in Tokyo who was then the Chief Cabinet Secretary and just last week he resigned from his post as PM. It was disheartening since I admire him as a leader. Anyway, we celebrated our 5th anniversary in Siem Reap Cambodia during the SSEAYP International General Assembly (SIGA). 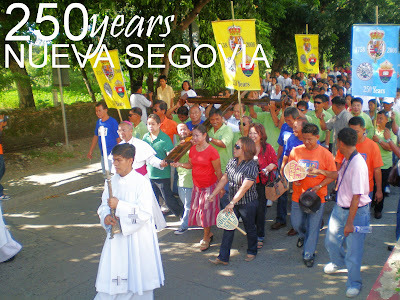 I met some of my friends from this program during the SIGA in Cebu last May 1-3 in Cebu. Hoping to celebrate our 6th anniversary on board the Nippon Maru when it docks in Manila for SSEAYP program. 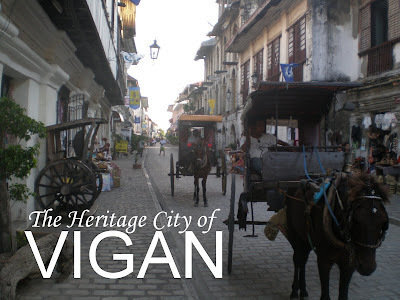 “A place like no other” is the description by locals and foreign alike to Vigan. The name was derived from a tuberous taro plant that belongs to the gabi family. This plant was endemic to the place especially in the river banks as they coined Kabig-bigaan for the place. 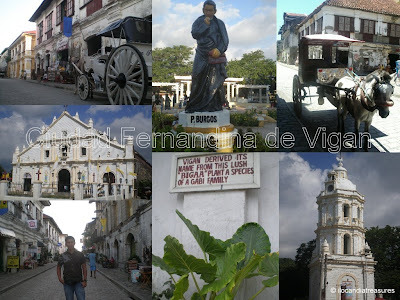 Vigan was founded by Don Juan de Salcedo in 1572 where he called this as Villa Fernandina in honor of the son Prince Ferdinand of King Philip II of Spain. In 1758 in the same year as the seat of Nueva Segovia was transferred to Vigan, the villa was elevated to Ciudad Fernandina de Vigan in honor of the reigning King Fernando VI of Spain. Did you know that Vigan is an island which used to be detached from the mainland by the Abra River, Mestizo River, and the Govantes River. It was a coastal trading post in precolonial times. The Chinese through the Mestizo River came to barter exotic goods and most of them intermarried with the natives. Since it is the only surviving colonial city, the Heritage City of Vigan was inscribed in the prestigious list of the UNESCO World Heritage Sites in the year 1999. One can experience traveling back to the past in the present modern age where one can take the calezas and get around Calle Crisologo. One can observe the fusion of Asian, European and Latin American influences in the architectural designs of the antiquated houses and the cobbled narrow streets. Its truly another site to behold. A gem of the Ilocandia. 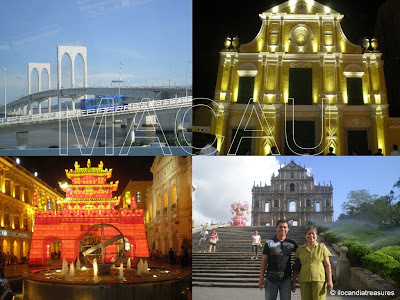 As a treat to my mom on her birthday, I took her to Macau on August 29, 2008. It was so great to be back on this former Portuguese colony for the third time. The very first time was on 2001 which was so memorable since I traveled solo. It’s the first territory I visited. I can still remember the excitement and the tension I felt going there not so familiar with the place and not knowing anyone. As I set my foot on this place, I came to love it. With the European architecture of buildings especially in the Senado Square and its calcada or Portuguese pavement, it’s like traveling to Portugal or other countries in Europe. This has been branded as little Europe of Asia. 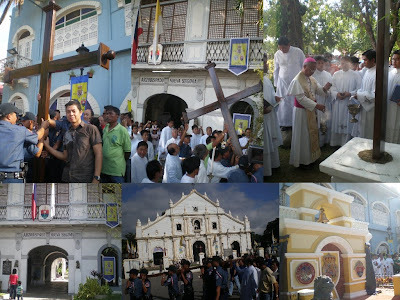 There are several Catholic Churches in the area such as St. Dominic and St. Joseph Churches. The historic centre of Macao provides a unique testimony to the meeting of cultural, aesthetic, architectural and technological influences from East and West. With the historic street, religious, residential, public Portuguese and Chinese buildings made it to the prestigious list of UNESCO World Heritage Sites in the year 1999, same year as it was turned over by Portuguese government to China. 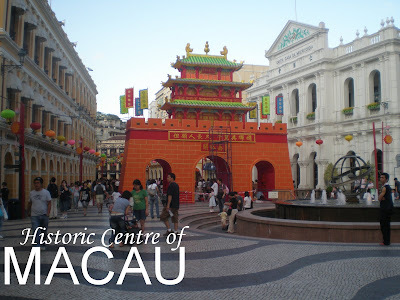 The name Macau was derived from A-ma Temple dedicated to the goddess of fishermen. Everytime they ask the name of the place the locals replied A-Ma-Gao. From the airport we rode the shuttle bus of Emperor Hotel then we walked a few steps to Central Hotel where we checked in. We have seen the Largo de Senado at late afternoon at night time. We had dinner of noodles at a Chinese resto. I went to see Grand Lisboa Casino. Had registered for free and got a membership card. I just observed how they play in casino. The following day, we went around visiting the ruins of St. Paul Church, St. Dominic Church, San Malo market and did a little shopping. Disneyland is branded as the happiest place on earth. It is the second most visited park in the world. It is owned by Walter Disney who produced animated films initially with characters of Mickey Mouse, Mini Mouse and followed by others such as Sleeping Beauty, Dumbo, Winnie the Pooh, Goofy, Cinderella and many others. I thought this is only for kids but I was mistaken. 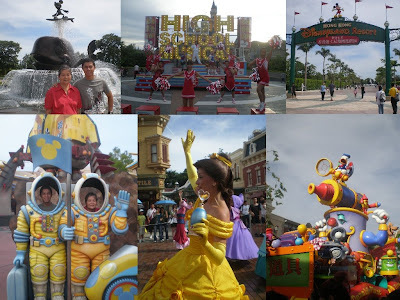 Everybody of all ages can enjoy Disneyland with all the rides and entertainment provided in the resort. We have the child in all of us so I relived that in me once more. Weekend is a peak day so an adult shall pay HKD350. 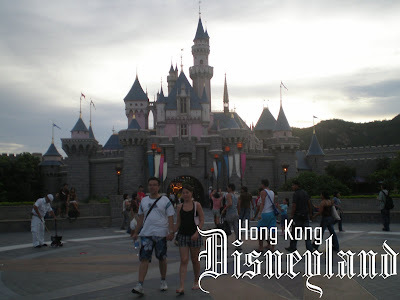 Its upgradable to annual pass by just adding HKD300 on that same day of purchase. Seniors and children entrance fees are given discounts. We started to visit some of the shops and bought some souvenirs. We watched the spinning of Toy Story Zoetrope, newest attraction at the Art of Animation. These are static characters that come to life by spinning. My mom and I were able to watch the Mickey Water Works on parade where the different Disney characters participated in the activity with all that of sprinkling water on the guests. It was really enjoyable to fight the heat in the park. After this, we went to ride the Disneyland Railroad where we alighted at Fantasyland and rode Dumbo the Flying Elephant with my mom. Later we joined the storybook journey through Hundred Acre Wood in the Many Adventures of Winnie the Pooh. We walked through the magical portal of the Sleeping Beauty Castle. Its so amazing that everybody can’t help but take photos. While my mom is taking a rest I went to Tomorrowland where I had a thrilling high-speed adventure that reached the universe in a dark space with the galactic forces, there was lightning, stars and constellations and then back to interstellar roller coaster. It was a great adrenaline pump. This is not recommended for people with hypertension or heart ailments. High School Musical: LIVE! came in to perform in the forecourt of the castle. They performed the hit songs from the movie and invited the audience to sing and dance with them. It was a very entertaining show. Next stop was riding the flying saucer of the Orbitron, then I drove the future electric cars that cruised along the highways of tomorrow at Autopia. That was an incredible ride. As a finale, we had an Stitch Encounter in an interactive movie. It’s a talk and play games with mischievous Experiment 626 (Stitch) at the Space Traffic Control Center. He has pointed some people from the audience and talked to them and responded in real time and situation. Its never the same show twice. The Tawid Choir members rendered Ilocano folk songs to their co-member Mrs Lydia Yapo and her guests in celebration of her 70th birthday in a Hawaiian motif party in Batac City. 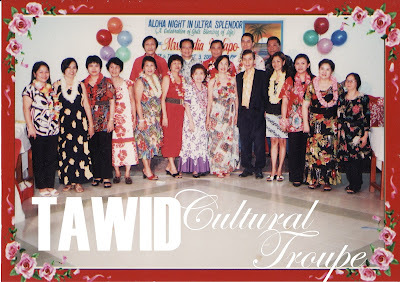 The Tawid Choir Members were invited to sing to the birthday party of co-member Mrs. Lydia Yapo in Batac on August 03, 2008. It was a Luau Night. The party was in a Hawaiian motif where everyone came in their Hawaiian costumes. The birthday celebrator was treated with the Padapadakam song as her family, relatives and friends wish her all the best of luck. 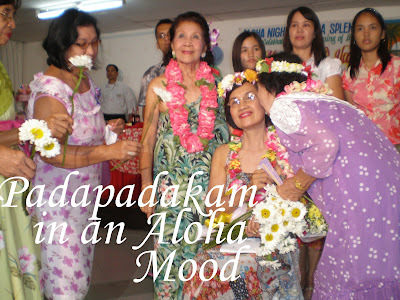 The husband initially crowned her with flowers while everybody sang Padapadakam. The well wishers offered flowers and bouquet one by one. This is a unique birthday celebration in Ilocandia.